For Taal Batangas visitors, It is highly recommended to get souvenir upon leaving the place, We suggest visitors to buy Balisong (knife) or commonly called as “Bente Nueve “. It is being fabricated at Bgy. Balisong. Brgy. Balisong is known due to the fact that most of the residents are selling “bente nueve”. The place is very near from Taal Public Market, Visitors can ride trycicle and within 15 minutes they could see lots of Balisong along side of the road. The are are also “Gulok” or Big Knife available in that place. Bite Handle The handle that closes on the sharp edge of the blade.Kicker (or Kick) Area on the blade that prevents the sharp edge from contacting the inside of the handle and suffering damage. This is sometimes supplanted by an additional tang pin above the pivots.Latch The standard locking system, which holds the knife closed. Magnets are occasionally used instead.Latch, Batangas A latch that is attached to the bite handle.Latch, Manila A latch that is attached to the safe handle.Latch, Spring A latch that utilizes a spring to propel the latch open when the handles are squeezed.Safe Handle The handle that closes on the non-sharpened edge of the blade.Latch gate A block inside the channel of the handles stopping the latch from impacting the bladeTang The base of the blade where the handles are attached with pivot pins.IKBSIkoma-Korth Bearing System. 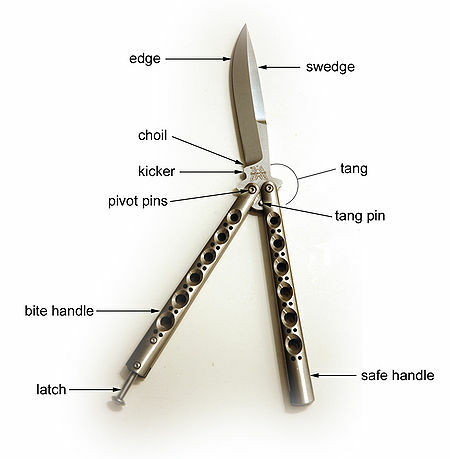 A high end ball bearing system that maximizes smoothness, found in high-end custom Balisong knives.Choil Small curve found on some knives just above the kicker, that makes it easier to sharpen the blade.Swedge Unsharpened spine of the blade that is angled to appear as if it were sharpened.